We took our first multi-family trip to the beach this past weekend. Wow... So not what we expected. I packed extra sand toys to share. I just had no idea what sharing was going to look like. I thought sharing meant "make Big Brother A share with the two friends who came with us." I was surprised to find that sharing actually meant "loan to every kid within eyesight of colorful beach toys." Part of me really wanted to count all of Big Brother A's toys, keep track of every one, and count them all as we packed up to go (we know we were missing at least two or three between our two families). Part of me wanted to ask the kids where their parents were and why no one was telling them to stop throwing sand (why was I suddenly in charge of five additional children?). But in the end, we asked their names. We played alongside them. We shared our beach toys. Some got lost. Some were taken down to the water, but respectfully and politely returned. Most of the time, the other kids were really sweet and fun to play with. It was a little frustrating not to be able to talk with the people I came with when the kids suddenly decided that they needed my one-on-one attention. 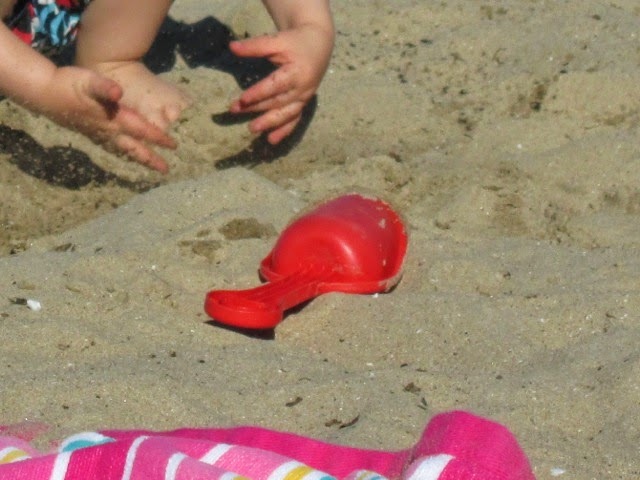 After all, I came to the beach expecting to relax in the sand, talk with the other grown-ups, chuckle at our silly sweet kids, and occasionally intervene over the use of the toy watering can. It didn't seem quite fair that my own family and friends were missing out (if I'm allowed to count my absence as missing out!). Josh and I discussed the beach chaos in length on the way home. We're pretty sure the parents were in eye sight, but not one of them asked us if it was okay for their children to take over our little plot of sand. We're not sure why they didn't bring stuff of their own. It wasn't the kids' fault that they had nothing to play with, and they were really on their best behavior for the most part. What's difficult is deciding whether we were enabling their poor parenting by allowing the children to play with our toys, benefit from our interaction, and land under our supervision. We don't want the kids to lose out. Ultimately, what's the bigger loss for them - not having attention from us for an hour, or silently telling their parents it's okay to be uninvolved and distant because caring strangers will always step in? Or are we missing the whole point and caught up in an example of cultural differences? In the end, we decided we couldn't have said no to that first little boy who asked to share our toys. We didn't know what the situation would turn into, and it would have been wrong to be possessive and rude in the beginning. We tried to think of this as a teaching opportunity for Big Brother A (really for us, too). It needs to be more important to us that we reach out and make others feel loved than that we protect our stuff. We want to be more concerned with sharing than keeping our share safe. We want to value making friends over having privacy or "space". As for the enabling - I haven't arrived at a solid conclusion on that one, although I've wrestled with it a great deal. Any thoughts?